Christmas is a time for family, friends, food and giving. This December bathstore has teamed up with Decembeard to encourage the nation to raise funds and donate to Beating Bowel Cancer. Unfortunately, not everyone can grow a beard so Bathstore are encouraging people to sculpt their own bubble beards! I had so much fun attempting to sculpt my own bubble beard. I think this is a really fun and worthwhile campaign. Bowel cancer is the UK’s second biggest cancer killer and unfortunately someone is diagnosed every 15 minutes. Yet if diagnosed early, more than 90% of cases can be treated successfully. This is why it's important for people to know of the symptoms in order to spot it early. Text BUBL15 to 70070 to donate £2 to a bowel cancer charity. Have a go at sculpting your own bubble beard and challenge your friends to do the same! 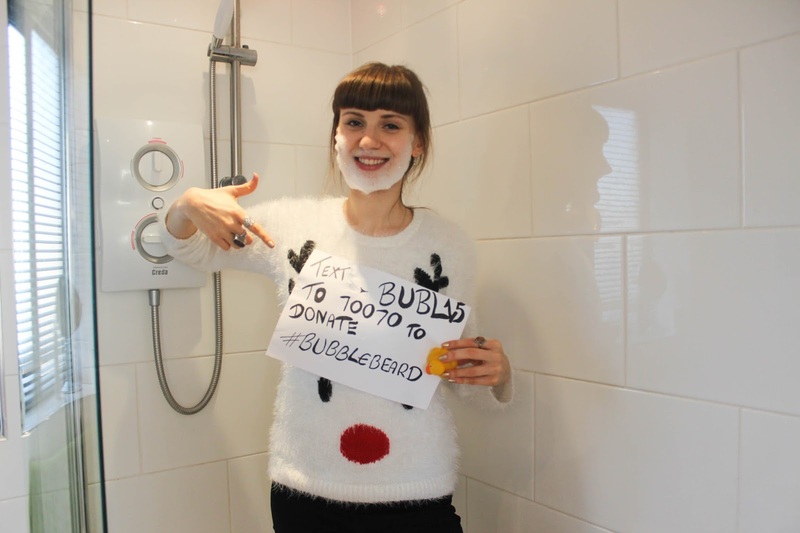 You can share your bubble beard selfie on social media using #bubblebeard. I think my awesome fluffy jumper from Workwear Express secret santa is worth a mention too. I hope you've all had a very Merry Christmas! You can also find me in all of these places, come say hi! Such a great cause - love this! Thanks so much Anika, I thought so too! this is so cute and such a good cause! Blog Layout by Trisarahtops Smiles. Powered by Blogger.